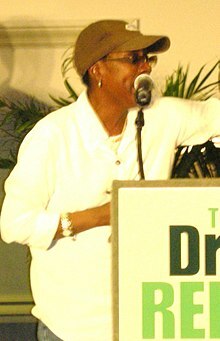 Afeni Shakur (born Alice Faye Williams; January 10, 1947 – May 2, 2016) was an American music businesswoman, philanthropist, political activist and Black Panther. She was the mother of the late rapper Tupac Shakur. Shakur was in Federal Court on July 20, 2007, to file an injunction to prevent Death Row Records from selling any unreleased material from Tupac. Shakur died in Sausalito, California from a heart attack on May 2, 2016, aged 69. ↑ Guy, Jasmine (2004). Afeni Shakur: Evolution of a Revolutionary. New York: Atria Books. p. 5. ↑ "Tupac's Mother, Afeni Shakur, Dead at 69". Billboard. Billboard. Retrieved 3 May 2016. This page was last changed on 12 February 2019, at 17:57.